I've enabled power saving mode with the edit on XDA. I also used the .xml edit that was posted for the Music Channel settings button to enable Beats and the Minor Quick Settings tiles. I'm just wondering if anyone else has enabled any of the "hidden" settings, and I'm also trying to get this section going a little bit. Well well well... Looky who gots a fancy M8. Congrats man. How you like it?? I like it a lot, but I don't have much to compare it to. The M was my first smartphone, then I bought the HD at the end of last year. So, I've never really owned a high-end phone, until the M8. I do like the support/development that's out there for it and it's just going to grow. I also like the fact that you can unlock it, without Verizon really batting an eye at it, unlike how they have locked the Motos and Sammies down. It also smokes the HD in every apect and the battery seems to be similar, or better. I'd also be willing to say that the M8 is quicker then my N7. Only time will tell, but I think I will have the HTC for quite a while. Now, I just need to get "learned up" on all of the HTC terminology. Nice. Yeah HTC has always had good Dev support and thank god they get the unlocks that has killed Dev support on other phones. I'd imagine it's a beast of a phone and coming from the HD it's like going from VCR to Blu-Ray. I'm still using my DNA at the 18 month mark and have been running the M8 Sense 6 Rom since your phone came out. ...or it's like going from 1x to 4g. I like it, but like I said, I don't have much experience with flagship devices. I really wanted to wait and see what the now Moto X was like, but I don't think it will have the dev support like the HTCs do. I'm squirreling away a few bucks here and there and will hopefully be able to purchases one by the end of summer. I'd really be happy if I can purchases one out right and not be bound to big red for two more years. Hopefully once I have enough saved up one will be available on Swappa or eBay. Android caused my divorce ! Omg this phone is stupid fast I'm so glad I didn't get a dev x I know benchmarks are nothing but going from around 6k with the xt926 to 25k with the M8 !!! Weak sausing it tonight s-offing it before court in the morning and praying that this thing gets some OSE !!! 25K is low. I can't remember exactly, but I ran a benchmark after flashing Viper and it was higher. I could combine the powers of my M and HD (maybe even the N7) and they still wouldn't come close. 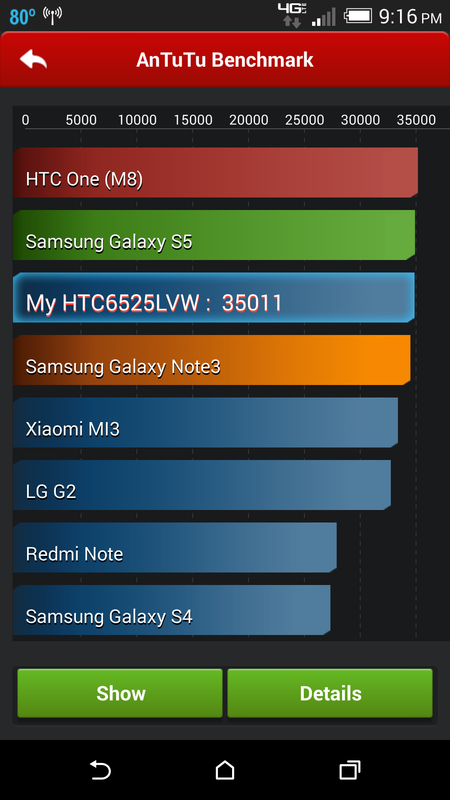 Some one make a post your benchmarks here thingy for the m8 I gotta see how high I can get ! Go ahead, man, you should be able to make a new post. Since I shattered the screen on my DNA and couldn't afford the Asurion claim I picked up an M8 on Wednesday. All it cost me was losing my unlimited data and switching to the more everything/Edge plan. No biggie as my bill actually went down a few dollars. Still researching if I can unlock with Weaksauce/Firewater or pay for the Sunshine licence. Until Then I'm spending the time getting used to what this device can do.